Christopher Hitchens once wrote that there were three major issues of the twentieth century -- imperialism, fascism, and Stalinism -- and George Orwell proved to be right about all of them. 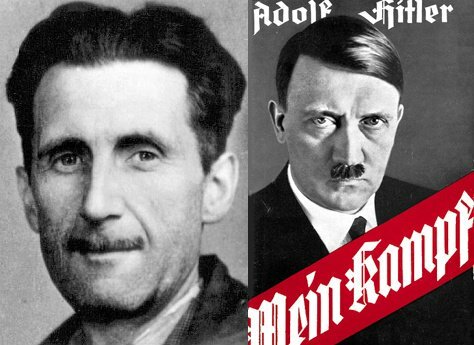 Orwell displays his remarkable foresight in a fascinating book review, published in March 1940, of Adolf Hitler’s notorious autobiography Mein Kampf. In the review, the author deftly cuts to the root of Hitler’s toxic charisma, and, along the way, anticipates themes to appear in his future masterpieces, Animal Farm and 1984. The fact is that there is something deeply appealing about him. […] Hitler … knows that human beings don’t only want comfort, safety, short working-hours, hygiene, birth-control and, in general, common sense; they also, at least intermittently, want struggle and self-sacrifice, not to mention drums, flags and loyalty-parades. However they may be as economic theories, Fascism and Nazism are psychologically far sounder than any hedonistic conception of life. What [Hitler] envisages, a hundred years hence, is a continuous state of 250 million Germans with plenty of “living room” (i.e. stretching to Afghanistan or there- abouts), a horrible brainless empire in which, essentially, nothing ever happens except the training of young men for war and the endless breeding of fresh cannon-fodder. The article was written at a moment when, as Orwell notes, the upper class was backpedaling hard against their previous support of the Third Reich. In fact, a previous edition of Mein Kampf -- published in 1939 in England -- had a distinctly favorable view of the Führer. By March 1940, everything had changed, and a new edition of Mein Kampf, reflecting changing views of Hitler, was published in England. Britain and France had declared war on Germany after its invasion of Poland but real fighting had yet to start in Western Europe. Within months, France would fall and Britain would teeter on the brink. But in the early spring of that year, all was pretty quiet. The world was collectively holding its breath. And in this moment of terrifying suspense, Orwell predicts much of the future war. When one compares his utterances of a year or so ago with those made fifteen years earlier, a thing that strikes one is the rigidity of his mind, the way in which his world-view doesn’t develop. It is the fixed vision of a monomaniac and not likely to be much affected by the temporary manoeuvres of power politics. Probably, in Hitler’s own mind, the Russo-German Pact represents no more than an alteration of timetable. The plan laid down in Mein Kampf was to smash Russia first, with the implied intention of smashing England afterwards. Now, as it has turned out, England has got to be dealt with first, because Russia was the more easily bribed of the two. But Russia’s turn will come when England is out of the picture -- that, no doubt, is how Hitler sees it. Whether it will turn out that way is of course a different question. In June of 1941, Hitler invaded Russia, in one of the greatest strategic blunders in the history of modern warfare. Stalin was completely blindsided by the invasion and news of Hitler’s betrayal reportedly caused Stalin to have a nervous breakdown. Clearly, he didn’t read Mein Kampf as closely as Orwell had. Dare I say that Orwell’s characterization of the appeal of Napoleon, Hitler, and Stalin seems to fit today’s radicalized forms of Islam as a glove fits a hand? Another man co-opting anything he reads (bonus points if it includes Hitler somehow!) for his pre-existing ideology, and ignoring everything that doesn’t support his beliefs. Yeah, you’re probably right. Although I will say in my own defense that I posed my comment as a question (i.e. “dare I say?”) to signal my discomfort with fitting too neatly into someone else’s box.nNonetheless, I don’t think that my comment was motivated much by ideology or specifically by the Hitler reference. The portion that most captured my imagination was the statement, “human beings don’t only want comfort, safety, . . . and, in general common sense; they also, at least intermittently, want struggle and self-sacrifice, not to mention drums, flags and loyalty-parades. . . . great dictators have enhanced their power by imposing intolerable burdens on their peoples. . . . and as a result a whole nation flings itself at his feet. Perhaps later on they will get sick of it and change their minds.” That’s a very general psychological claim, that presumably could be tested by looking for other contexts in which it might apply. I also happen to like the latent optimism that this drive to struggle and suffer is only “intermittent” and that it is possible to get sick of danger and death and change one’s outlook. You are right. Your view sadly is too politically incorrect for others to see it as Orwell’s take on Stalin and communism was too far ahead of its time. I felt the same thing when I read the review. I think perhaps we can gain some insight into the psyche of a new authoritarian leader developing on the other side of the Atlantic, from Orwell’s words. Albeit it seems now the perceived victim isn’t just the ruler – it’s all white men. Sigh…no it was not a blunder. You’d think educated people would know by now, but no. It even says it in the review! The whole point of WWII was to seize Russia! Otherwise Germany would not be able to feed itself and would become dependent on imported food, which would make it a slave of the bankers. It didn’t work, which came as a surprise to a lot of people, Soviets included. After all, the famous Red Army had just lost to a tiny piss-ant country. Finland? Whodat? And this is your opponent for the next round? A very mediocre review from a writer who got famous due to the unique topic of his stories but never could improve his very mediocre prose.